Kansas City, MO, February 28, 2016	(Newswire.com) - ​​​​​​It was just another "weekend a month" for Will M. Helixon. When many civilian court-martial defense lawyers are looking to spend their down time with their family or hitting the slopes for a final time this season, Will M. Helixon spent two days working with the Fort Leonard Wood Office of the Staff Judge Advocate assisting their trial counsel prepare for two trials this week. As a Lieutenant Colonel with the 8th Legal Operations Detachment, headquartered in Independence, Missouri, Will Helixon is often requested by the active component to work with their trial advocates generally to improve their litigation and advocacy skills, and specifically assist them in preparing for upcoming trials. "This week, Lt. Col. Rob Stelle, the Deputy Staff Judge Advocate at Fort Leonard Wood and I focused on opening statements and working with the individual prosecutors with pending cases on trial preparation. Last year, I was asked to prepare and deliver a block of instruction on how to effectively cross-examine an accused," Lt. Col. Helixon said. That specifically created block of instruction was presented to the prosecutors at both Fort Leonard Wood, Missouri, and the prosecutors at Fort Leavenworth, Kansas. "In addition, we analyzed the pending sexual assault cases on the docket at both installations," Lt. Col. Helixon continued. Before leaving active duty in August 2014 and joining the 8th Legal Operations Detachment, Lt. Col. Helixon had been trained and certified to be a military judge, although he never served as a military judge. He served as a Special Victim Prosecutor for the U.S. Army from June 2010 to August 2014, primarily prosecuting cases in Germany and Italy. Additionally, Lt. Col. Helixon served as a trial counsel, senior trial counsel, senior defense counsel and chief of the Defense Counsel Assistance Program, responsible for developing and delivering advocacy training to the nearly 300 active duty and reserve U.S. Army Trial Defense counsel worldwide. 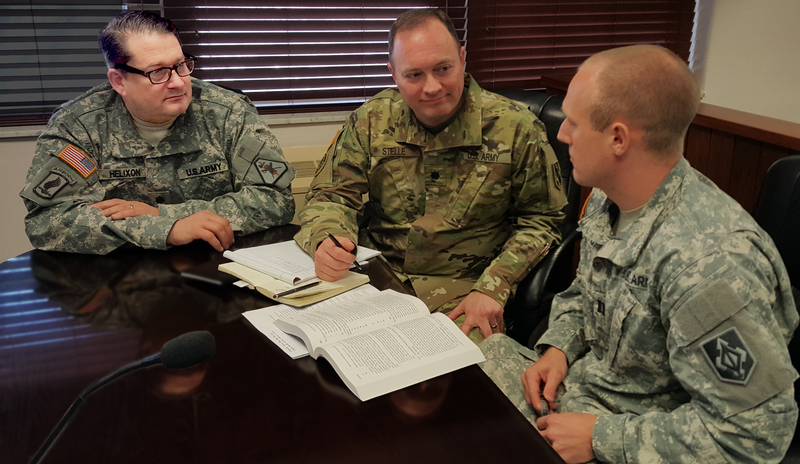 "Frequently, members of the reserve Judge Advocate General's Corps are asked to assist the active component in general with personnel support, and more specifically, by assisting on specific cases," Lt. Col. Helixon noted. Although he has a private practice that specializes in defending military personnel against the government in courts-martial and other administrative actions worldwide, Lt. Col. Helixon said that it is not unusual for reservists to assist the active component in areas that are not aligned with their civilian practice. Admitting that he would be disqualified from assisting an accused with a case on which he advised the government, he insisted "the ultimate goal is the improved administration of military justice, and that will always be in the best interest of the accused." "When prosecutors are prepared, understand the issues, and efficiently present their cases, the risk of trials becoming side tracked, bogged down on unimportant issues or unnecessarily confusing issues becomes much less likely. That in turn decreases the likelihood that a fact-finder will make a mistake and wrongly convict an innocent accused," Lt. Col. Helixon emphasized. "Nobody wants that." Although there are no specific dates at this time, Lt. Col. Helixon expects to continue to work with other active component JAG offices at multiple installations during his reserve duties. "When I contribute to military justice, whether in uniform or in my civilian capacity, I always strive to leave the process and system better than when I arrived. That means being cordial, following the rules, and vigorously advocating for your client. This zealous, fair and ethical advocacy makes the adversary system the best system in the world for handling criminal justice matters and ensures both systemic and individual justice." This article in no way should be considered an endorsement of the Law Office of Will M. Helixon by the U.S. Army or the Office of the Staff Judge Advocate, Fort Leonard Wood, Missouri.